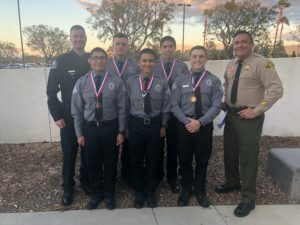 From February 15 – 19, 2018, five Explorers, accompanied by two Explorer Advisors, attended the Orange County Law Enforcement Explorer Academy’s 86th Class. The Explorer Academy simulates an abbreviated basic law enforcement academy. Explorers Brayan Garcia, Chris Garcia, Andrew Gray, Corbin Randall and James Rangel successfully completed this rigorous 5-day academy. Our Explorers were accompanied at the Academy by their Advisors, MCSO Deputy Nino Hernandez and MLPD Officer Daniel Hansen. Special recognition goes to Explorer Chris Garcia who won an award for 3rd place in a physical agility test out of a class of 160. The Mono County Sheriff’s Office and the Mammoth Lakes Police Department began a combined Explorer program at the end of 2015. Thanks to a generous donation from a member of our community, this program is available at no charge to eligible youth from Mono County and the Town of Mammoth Lakes. Law Enforcement Exploring is a hands-on program open to young men and women who have completed the 8th grade through 20 years old, interested in a career in law enforcement or a related field in the criminal justice system. I’m so proud of Brayan Garcia!! If no one noticed, he was also one of the top contenders in the Poetry Outload competition in Mono County. His family are hardworking people and have instilled this positive attitude in Brayan! You will go far, young man!